Blobster is a very simple game with a considerable amount of complexity created in the level designs. In this game you take control of a blob who must collect the gems which are scattered around the levels, as well as reaching the tube at the end of each level. Getting in the way are other blobs, water, escalators and a variety of powerups which help you to get past the many barriers. A causal game that you could easily sit down and play through in a couple of hours, but is designed with short and fun levels that can fill the five minute gaps in your day. This game is a pretty simple side scrolling video game at its core. In most levels you simply need to get from the left to the right. You are simply trying to collect all the gems in a level and then reach the end. There is no real time limit, yet it does keep track of time. This means that you can play this game more or less as a simple puzzle game or try to hurry through in a more action based game. In addition each level really does feel very different with each level focusing on some specific idea. For example, in one level you get a life preserver allowing you to travel through the water. Another is full of gears which squeeze and push you through. Of course as you progress these do combine into more complex puzzles, but generally it remains a light and fun game that is never too difficult. 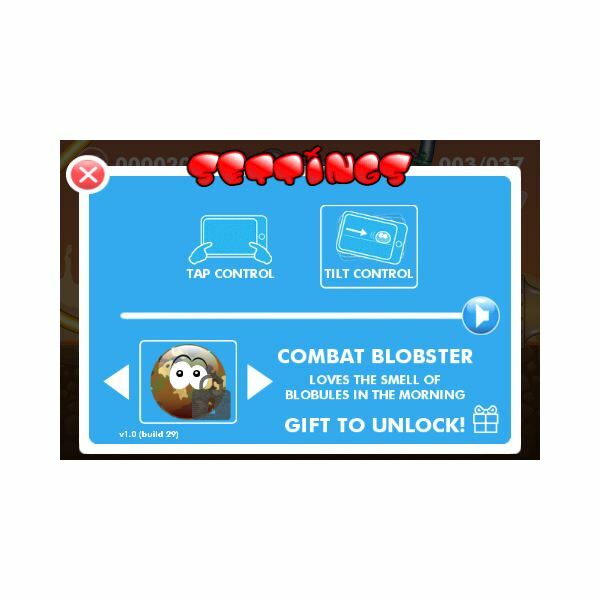 One of the weaknesses of Blobster is the controls. There are a lot of good things about it, but the most basic part is a bit frustrating. In order to move to the right or left, you touch the side of the screen. This is easy enough, but in order to jump you must touch the blob and pull it in the opposite direction and shoot it forward. This also works well — the problem is that in many cases, in order to really get where you need to in the levels, you need to do these two actions together. This is not easy and often it can be frustrating, though as you advance in the game it does become a bit easier — though fighting the controls does remain a problem throughout the game. There is also a tilt control option. This is a bit better though it also takes some time to get used to, but at least the second option means you can find which works best for you, though neither really feels great. Blobster begins with a short comic strip that explains the basic story. It is a bright and simple cartoon that you can scroll through easily. This sets the tone for the entire graphical design of the game, which keeps that light cartoonish design throughout. Even the enemies are filled with the same Saturday morning cartoon look and feel. This fits perfectly with the tone of the game so that there is nothing stopping a kid from playing the game, but at the same time it remains difficult enough that a lot of adults will like it. There is no music in this application, and if you try to play your own music the sound in it will stop it from playing. There are a fair amount of sound effects though. And while they are simple, they do add some flavor to the game. This is a casual game and, given a bit of time and effort, anyone should be able to make their way through any level in this game. Yet while it is a simple, fun game, like many other games it has that elusive 100 percent goal. Since you can defeat any level without getting all the gems this means that they can hide many of them in far more complicated locations allowing for them to create a difficulty in the game that would otherwise simply be frustrating. And they do this a fair amount with gems and powerups that you only find if you are looking for new things – a bit like finding golden eggs in Angry Birds. This is a classic example of a very fun and simple game that is a good value at $0.99 with short levels that can fill a quick break, or a few minutes in the waiting room, but won’t keep you interested so long that you run your battery down and find yourself missing calls; which is both a good and a bad thing.